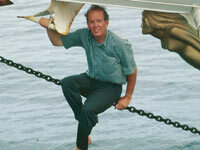 Dr. Roger Payne has been studying whales and working for their conservation for over 30 years. In his online audio pieces, A Voice from the Sea, Payne discusses the fate of the world's oceans, connecting it to daily experiences aboard Odyssey. In One Ocean, Dr. Payne writes about the effects of pollution and toxicology on the marine environment. "Powerful Sound Sources in the Ocean: Sperm Whales and Military Sonars"
The Deceptive Decibel - Pitfalls in the Discussion on the Effects of Underwater Man-made Noise on Marine Mammals"
"Sound in the Sea - a new series on Ocean Acoustics"
Is Scientific Whaling Motivated by Curiosity? Research Pretenders - Rubbing the Name of Science in the Mud. Various text passages in the following Voice from the Sea pieces excerpted from In the Heart of the Sea, by Nathaniel Philbrick, published by Viking, a member of Penguin Putnam Inc. Copyright 2000 Nathaniel Philbrick. Used by permission of the publisher and author, all rights reserved. Why Voice from the Sea Pieces? The Geology of the Galapagos Islands. Stars and the Swallow-Tailed Gull. Getting caught in a net off Sri Lanka. The devastation caused by long-line fishing.